1. Preheat the oven to 220˚C, gas mark 7. Toss the courgette, peppers, onion and garlic with 1 tbsp olive oil, season and spread out on a baking tray. Roast for 20 minutes before adding the tomatoes and roasting for a further 10 minutes. 2. Meanwhile, warm a griddle pan over a high heat. Toss the beef in the remaining oil and black pepper. Season with a little salt and thread onto 4 wooden skewers (making sure they have been soaked in water beforehand). Cook on the griddle for 2 - 3 minutes on each side until slightly charred. 3. 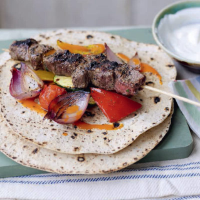 Serve the skewered beef and roast vegetables on warmed fl atbreads with the yogurt and chilli sauce.